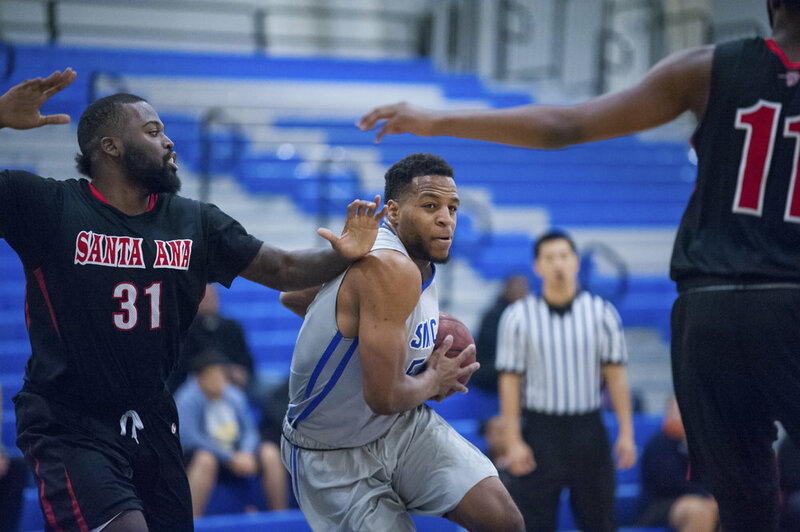 While the Fall 2017 semester has come and gone, basketball continues action in winter time, as the Santa Monica Corsairs Men's basketball team hosted the Santa Ana Dons at the Pavilion on Wednesday, Dec. 20 in Santa Monica, California. Their second home game this season, the team was previously scheduled to host Allan Hancock on Dec. 6, but that game was cancelled and rescheduled due to the Skirball Fire. 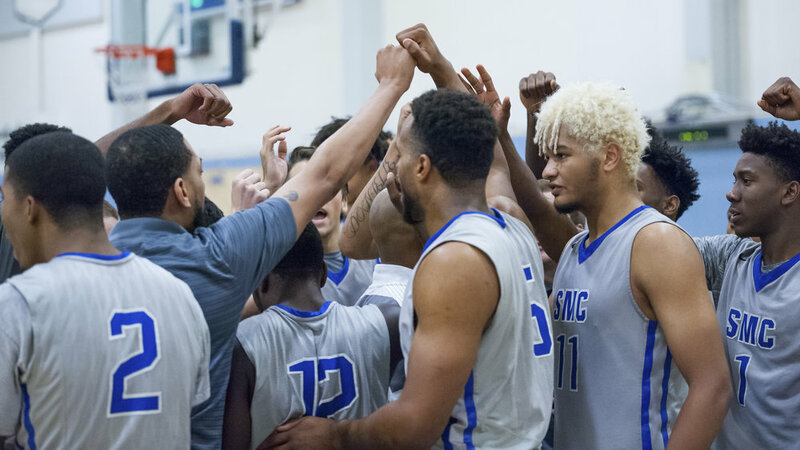 The team came off of a tournament loss at Grossmont College and looked to get back on track. The game started out with both teams trading scores in the opening minutes. The Corsairs would get the upper hand within the final ten minutes at the half, as they embarked on a 7-2 run that lasted for two minutes to give them a seven point cushion, highlighted by a pair of three-pointers by Joe Robinson. They maintained their momentum to give them a 41-33 halftime lead. In the second half however, things began to crumble for the Corsairs, as Santa Ana came storming out of the gates by scoring eight unanswered points within the opening two minutes. The Dons went on a 14-5 run in a span of five minutes before the Corsairs tied the game up at 48-48 to put an end to the run. For the next two minutes, both teams had quality chances to take the lead, but were met with defensive resistance and and miscues. Santa Ana took the lead with at 13:56 mark of the half, and extended their lead to eight points before the Corsairs were fighting to cut the deficit. However, things looked completely bleak for the Corsairs as the Dons embarked on a 15-6 run with 8:26 left to go. Missed shots, defensive miscues, and out of timeouts, the Corsairs were trailing 80-62 with just 3:46 to go. The Corsairs need a miracle to overcome this deficit with little time left. Jhamad Norwood made a three-point jump-shot at the 3:33 mark to instill some life for the Corsairs. Norwood followed that up with a layup to cut the deficit to 13. Santa Ana made a three point jump-shot of their own, but Norwood made three-consecutive free-throws to bring the Corsairs back to within 13 points with 2:41 to go. Justin Coats hit a three-pointer of his own to cut Santa Ana's lead 83-73 with 2:02 to go, and later fouled with under to go to preserve more time on the clock. Santa Ana converted one of two ensuing free-throw attempts. Norwood hooked with a layup to cut the deficit to nine points. Joe Robinson made a key three-pointer cut bring the Corsairs back by seven points, before Santa Ana responded with a two-point layup to put them back up by nine, the Corsairs followed with Norwood's three-pointer to bring the Corsairs back by six, which brought the crowd back into the game. 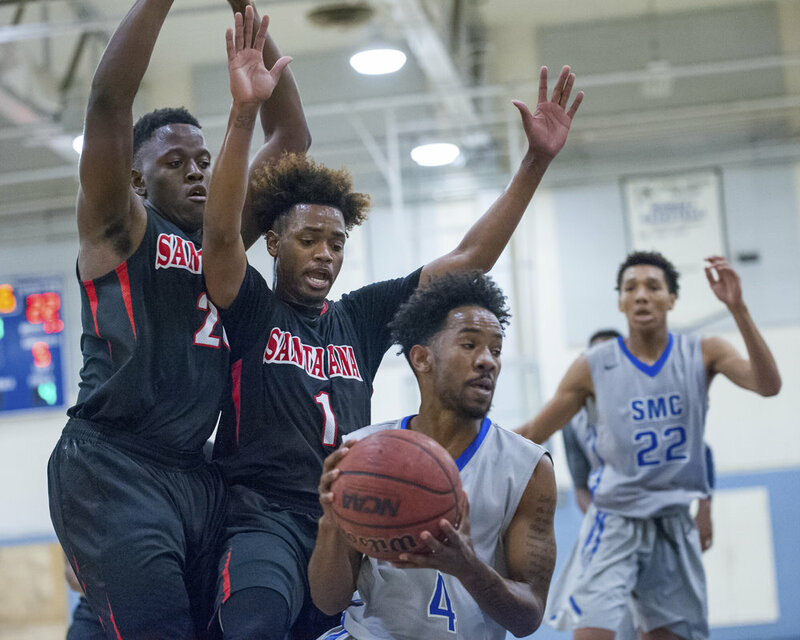 Turnovers and miscues brought the Santa Ana Dons on their heels, and Joe Robinson made three-consecutive free-throws to cut the deficit to three points. 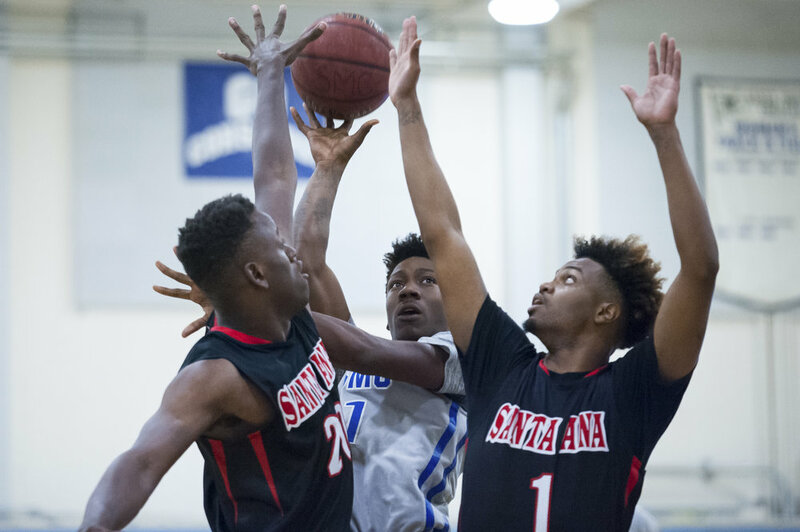 Santa Ana converted back to back free-throw attempts, but Robyion Hughes cut the deficit in half with a three-pointer with 17 seconds to go in the game. 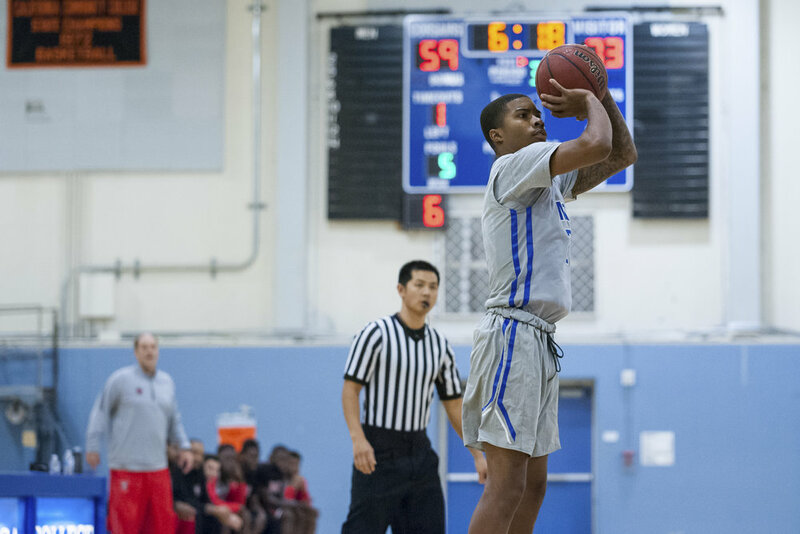 Santa Ana converted two more free-throws, but Hughes made another crucial three-pointer to bring the Corsairs back to within one point with 14 seconds left. Santa Ana tried clear the ball from their own zone, but turned the ball over after errand pass went out of bounds. The crowd was electric for this decisive moment of the game. Then, with just six seconds left to go, and the Corsairs trailing 91-90, Ethan Jarrell was in the paint to grab an offensive rebound, missed his first attempt, but followed with a put-back shot to give the Corsairs the lead, generated an uplifting roar from the crowd and his teammates. When asked what his thoughts were before and after the shot, Jarrell said, "Before I just seen that my teammates had the ball in the paint, and I knew that they were gonna go for it because we didn't have much time left. So I decided to just go follow the shot and rebound it and put it back up. After that I was just like 'i just hit the game winning shot' I was just going crazy." The Corsairs held on for the final six seconds to win 92-91, on a game that looked to be out of reach earlier in the half and seemed impossible to come-back from. When asked about this win, Head Coach Joshua Thomas said, "We feel really good, we needed any win that we can pretty much get right now. This'll be our third win of the season we're 3-9 and we've been struggling a whole lot. So it was great to see the guys fight back at the end, and the players made plays...and we had guys who hit big shots after big shots to allow us to come back and win this game." Joe Robinson made a big impact on the court, as he lead the way with 26 points, 4 rebounds and 3 assists. When asked about this performance, Robinson said, "Just got to stay consistent. We got a young team, and me, Jhamad and another sophomore, we got to lead them. So that's my job basically." 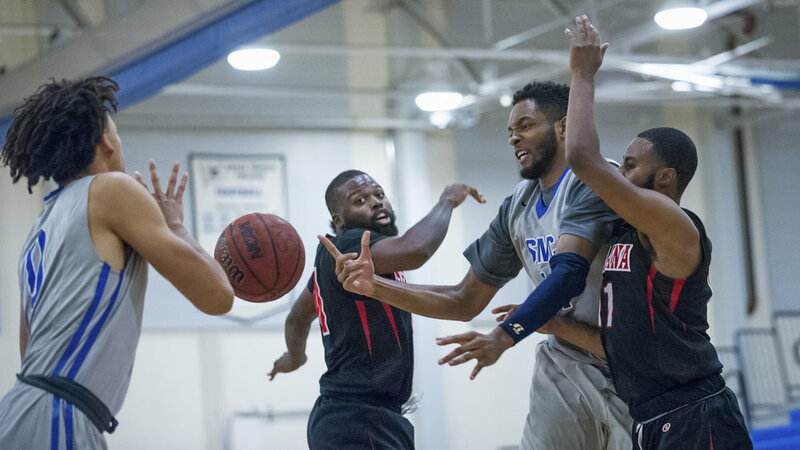 Jhamad Norwood finished with 21 points, 3 rebounds and 3 three assists, while Robyion Hughes finished with 18 points, 6 rebounds and 4 assists, and made the crucial three-pointer that got them back to within one point. Hughes said, "It's just shots for me. I practiced and practiced and my teammates encouraged them. So I just took the shot and put the the game on my hands." The Corsairs have improved to 3-9 this season, and will look to build on this emotional win as they will host the Los Angeles Harbor Seahawks on Saturday, December 23, 2017 at the Pavilion in Santa Monica, Calif. This upcoming game will close out the year 2017, before the Corsairs begin to prepare for the games next year.